SpaceX’s Falcon 9 rocket blasted off on Sunday, on the second attempt this weekend, recovering from technical issues which thwarted the planned launch a day earlier. Originally scheduled to blast off on Saturday from the historic Launch Complex 39A (LC-39A) pad at Kennedy Space Center in Florida, the first attempt was scrubbed due “to a second stage thrust vector control issue” only 13 seconds before lift-off. NASA confirmed the separation of the Dragon cargo vessel from the rocket in a tweet, with the former then continuing its journey to the International Space Station (ISS). The space agency also confirmed the deployment of the solar arrays that will power the module for the remainder of its journey before it docks with the ISS early on Wednesday. Dragon is on its way to the International Space Station. Capture by @Space_Station crew set for early Wednesday morning. The ISS bound vessel is carrying 5,500 lbs (2494 kg) of cargo, including a deadly superbug, as part of an experiment to examine how the bacterium will mutate in low gravity environments, with a view to improving antibiotic efficacy on Earth. Using a robotic arm, two astronauts will receive delivery of the bug responsible for killing more Americans every year than HIV/AIDS, emphysema, Parkinson’s disease, and homicide combined. The ISS crew will monitor the samples using the cutting edge Gene-RADAR device, hoping that data uncovered can help refine models of drug resistance and support development of better medicines to counter it, NASA said. 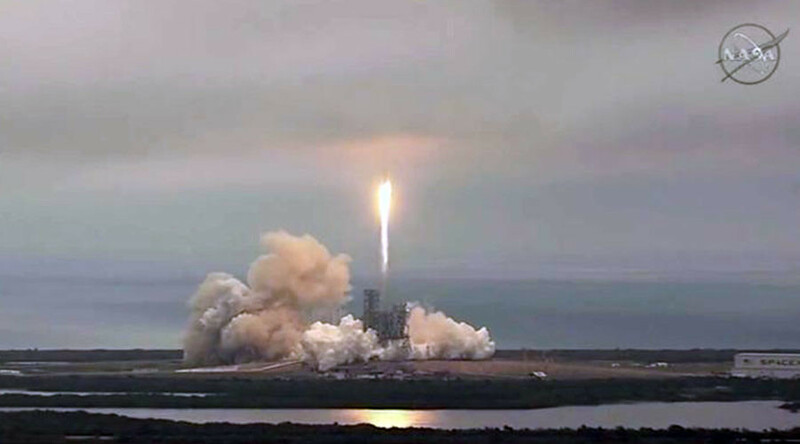 The launch is the tenth of 20 resupply missions to the ISS that SpaceX has been contracted to carry out for NASA, and was the first to lift off from LC-39A since the end of NASA's shuttle program in 2011. LC-39A was also the scene of the pioneering Apollo missions which landed the first men on the moon in 1969. The Falcon 9 rocket is a two-stage craft, both of which are designed to return to Earth for use for other space missions. The larger vessel makes a return landing to Earth after its launch into orbit. Just watched(and felt)the Space X #Falcon9 launch from 3 miles away and the feeling was 💥💥💥- no words. The other part of the rocket, called the Dragon craft, will split from the Falcon 9 in space and dock with the ISS. The Dragon will then return home after about one month, splashing down in the Pacific Ocean off the coast of California. In September 2016, SpaceX also suffered an unsuccessful launch after one of their Falcon 9 booster rockets exploded on a launch pad at Cape Canaveral. On board the rocket at the time was a satellite which Facebook was hoping to use to provide broadband access in Africa.